Comic artist and illustrator, Aisha Franz, chatted with writer Michelle Kay about comics, the writing process and her graphic novel, “Earthling,” which has been translated into English and distributed by Drawn & Quarterly. Aisha Franz embarked on a North American book tour in November 2014. 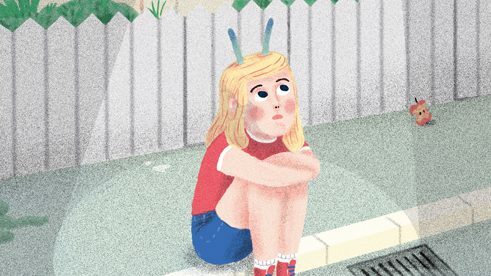 Earthling is the story of a little girl who befriends an aloof alien. The story is a day in the life of the girl, her older sister and their mother. Everyone is grappling with their own problems: regret, teenage rebellion and sexuality. There is not much action but despite its simplicity, there is a lot to reflect upon. I want to start off talking about Earthling. The story is about three women, well, one girl, one teen on the brink of womanhood and their mother. Could you tell me about how you developed their story? It all started with a drawing of the younger girl and the alien. Again, it was more like a stupid idea I had to create a story of an alien, but then I realized the girl’s character reminded me a lot of myself when I was that age so I thought it might be more interesting to tell her story. I just started making up all these ideas of what it should be about, creating scenes of what she would be doing, thinking of myself at that age and what I had to deal with when I was about to grow up. That’s how it started. The other characters just got into the story. I developed it while I was drawing. I never wrote a storyboard. I read in other interviews that your characters determine their own stories themselves. Do you let that happen organically? You say you don’t make a plan for it, so where do they come from? It’s a mix of personal experiences and little details, things I experience in everyday life. Most of the time [those details] are the triggers for stories. I remember a little detail, something I saw and maybe there is the potential to create something around that object, whatever it is. When I created Earthling, it was my first longer comic. I didn’t really know how to approach it (story-telling) so I approached it in a naïve way by just doing it. Back then, it was a composition of thoughts, emotions, memories. Then you get to a point where [the story] comes to life and the characters start talking to each other. That’s what really got me into comics. One thing that struck me about Earthlingwas that there is not that much text. A lot of your work involves panels, and the panels are very expressive even though there isn’t necessarily text that gives context. Is that your preferred style? Would you rather let the illustrations speak for themselves? Yes, I guess it’s not very conscious. I guess I’m just bad with words. (Laughs) I’m trying now to develop a writing style I can work with in my comics, just to find a new way, but in general, that’s why I do comics. I’m not very confident with writing. Maybe it’s also avoiding it, but it doesn’t cross my mind. When there’s text, there is no other way, there has to be dialogue. You’re still able to get the story across. What I liked about Earthling is that you’re able to convey all these feelings and complexities through drawings. I don’t like to compare comics with films, but [in the past], I wasn’t really used to reading comics. Most of my visual imagination and story-telling came from movies scenes. And I thought, “How would I express that?” It’s a very slow pace, the whole story. I want to ask about the characters themselves and their relationships to each other. What were your intentions in creating snapshots of these three people’s lives and how they connect with each other? Since it started off with the one girl, I quickly thought there had to be other characters to mirror her emotional situation. Initially I tried to make them connect more, communicate more, but it didn’t feel right because each one is so into her own thing and her own problems. They’re not actually able to communicate [with each other] so they communicate in this very stereotypical way that sisters do with their mother. It’s very superficial. It’s something you can see in a lot of families. They play their roles but once you close the door to your room, everything that is inside your room is totally different with things the others don’t even know about. Like you’re hiding an alien in there. Why did you want all the characters to be female or did you play around with the idea of having a father or a brother? I played around with the idea of having a father but the story just didn’t give him any space. It was always like, I had him in my mind, when is the father going to appear? It just couldn’t be. It wasn’t very conscious as well. The story told me not to. He’s there but very marginal. It’s easier for me—if it’s such an intuitive story, to project it on a female character. Both of them, the younger sister and her older sister, they both are very much me at that age and represent what kind of dreams or anxieties I had back then. The mother is maybe a projection of fears, I would say. It’s also very personal. It happened. It would seem so fake, if I had used a father. Why doesn’t Mädchen (the young girl) have a name? For the sister, I tried to avoid giving her a name. The mother has a name because I think she is a character, who is the most far away from myself and it was easier to project a name onto her. It also fits though, because it’s [location is ]a suburb but it could be anywhere. Neither time nor places have a name. I wanted to keep it very open. Also I couldn’t really decide. But I also don’t want to be so self-projecting and talk about a certain place where I lived or something. I just wanted to see if it works. It works because the things that they go through are universal. People in Canada or Germany all go through it. I also want to ask about going from self-publishing to distribution by D&Q, which is a well-respected publishing company and a big deal in N. America. For me, it’s not a big deal. I will always be self-publishing. It’s just a thing I do and will keep doing. I mean, it feels different because my first comic was published by a well-known publisher in Germany, Reprodukt. That was the first step I took in the comics world. It was literally the other way around. All of a sudden I became a cartoonist, which I didn’t plan to be but then suddenly I was one. I don’t see myself as a writer, going from book to book. I need a lot of space to experiment and to have fun and hide in my next project. It’s more like a playground, self-publishing. It’s a great way to connect with people, to do collaborations. I also want to ask about [Berlin collective] Treasure Fleet. (Laughs) Well, it all started off, we lived in different cities and we knew each other’s work from the Internet, mostly Flickr. We were all people who just graduated from art school. We all moved to Berlin at the same time. My friend Till had this idea, since we were all self-publisher, we should all just get together and have this community and distribute our comics together, which would be easier than if we were [doing it] by ourselves. So yeah, we became friends, and started going to festivals, book fairs, small press fairs. We actually just quit. Treasure Fleet is kind of dead now. But it’s just a cycle. Something new is going to happen. There is always a need for it. But it’s great to have a community. It’s hard to be on your own. It’s like that in Toronto, all the graphic novelists and comic artists form a community. How important is that, especially doing the work that you do? For me, it’s maybe the most important thing. I don’t know if I would be doing it with so much enthusiasm, if there wasn’t a community. I have to say in Berlin, there are a lot of different small communities, not one big one. It’s important to have exchange and support. It’s something you have to do. Most the people I know have a day job and still find the energy and feel devoted to [comics]. That only happens if you have a community. Do you see many differences between comics communities, say Canada and Germany or Toronto, Montreal and Berlin? Well, I’m still getting to know people in Toronto, Montreal but there are not so many differences. The visions and the whole energy of communities (I also met a lot of people in Baltimore, the U.S.) but I would say there is a difference in approach and style. That’s really interesting of course. There are a lot of styles everywhere. To the core, it’s very similar, I would say—the ideas that people share. Is there a specific style to sum up Germany? I don’t know. People have asked me that and I’m not sure. Of course there are certain styles that come from different art schools due to the professors teaching there. There’s like using pencil and more expressive drawings from Hamburg, maybe a little rougher and colourful from Leipzig. Or here in Berlin, maybe a more geometrical style. I am working on a new book after a break doing a lot of smaller projects and self-publishing, commissioned works and travel. My publisher here said, “It’s like a grown-up Mädchen!” It’s going to be a little bit likeEarthling but it’s about a 13-year-old in a big city. I’m actually trying to go back to how I developed the story for Earthling.I’ve been trying many different ways. It’s been very cool to experiment. I miss what I called earlier, a naïve approach to the story and trying to find a way to go back to it to really let it out. It sounds so cheesy but it’s a therapy to go back. Is it possible to go back to naiveté? (Laughs) I don’t think so, but you can pretend. Maybe I can reflect on the techniques I didn’t know about then but that I used and now I can be wiser about it.